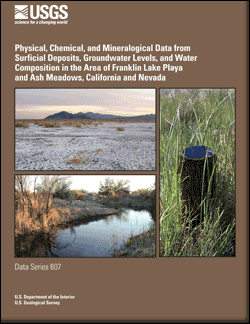 This report presents data and describes the methods used to determine the physical attributes, as well as the chemical and mineralogical composition of surficial deposits; groundwater levels; and water composition in the area of Franklin Lake playa and Ash Meadows, California and Nevada. The results support studies that examine (1) the interaction between groundwater and the ground surface, and the transport of solutes through the unsaturated zone; (2) the potential for the accumulation of metals and metalloids in surface crusts; (3) emission of dust from metal-rich salt crust; and (4) the effects of metal-rich dusts on human and ecosystem health. The evaporation of shallow (<3 to 4 m) groundwater in saline, arid environments commonly results in the accumulation of salt in the subsurface and (or) the formation of salt crusts at the ground surface. Ground-surface characteristics such as hardness, electrical conductivity, and mineralogy depend on the types and forms of these salt crusts. In the study area, salt crusts range from hard and bedded to soft and loose (Reynolds and others, 2009). Depending on various factors such as the depth and composition of groundwater and sediment characteristics of the unsaturated zone, salt crusts may accumulate relatively high contents of trace elements. Soft, loose salt crusts are highly vulnerable to wind erosion and transport. These vulnerable crusts, which may contain high contents of potentially toxic trace elements, can travel as atmospheric dust and affect human and ecosystem health at local to regional scales. Goldstein, H.L., Breit, G.N., Yount, J.C., Reynolds, R.L., Reheis, M.C., Skipp, G.L., Fisher, E.M., and Lamothe, P.J., 2011, Physical, chemical, and mineralogical data from surficial deposits, groundwater levels, and water composition in the area of Franklin Lake playa and Ash Meadows, California and Nevada: U.S. Geological Survey Data Series 607, 153 p.